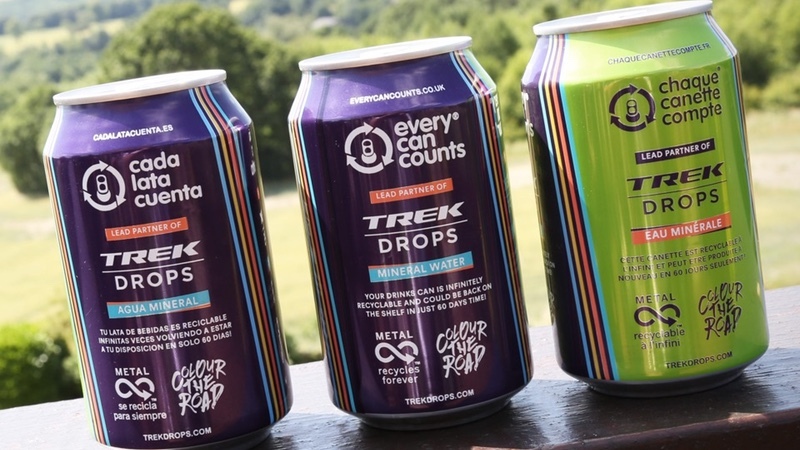 Every Can Counts, the drink can recycling campaign, has created an exclusive Trek-Drops can in partnership with the Trek-Drops professional women’s cycling team. The limited edition team-branded drinks can will be first available in the Fan Zone at La Course by Le Tour de France, on Tuesday, 17 July 2018. The Trek-Drops can’s eye-catching design is aimed at attracting the attention of cycling fans. Not only are the cans a collectors’ item, they are filled with mineral water to help quench the thirst of spectators and Trek-Drops riders at cycling events. Tom Varney, Team Director at Trek-Drops, is looking forward to showcasing the cans and he said “We’re delighted with our partnership with Every Can Counts and this initiative is just another sign of the enthusiasm that they place into our project. The cans will give us another way to engage directly with fans and spread the message of the importance of recycling their cans and their choices of packaging when they are in retail environments. Every Can Counts, alongside its French counterpart ‘Chaque Canette Compte’, will be encouraging people to cycle and recycle at La Course by Le Tour de France by taking part in their unique ‘Recycling Game’. Families and friends can race against each other whilst learning about the unique recycling process – and then be ‘treated with a refreshing Trek-Drops drink when they finish’. The Every Can Counts team will also be at the Prudential Ride London event on Saturday 28 July 2018, where visitors will be able to get their hands on the limited edition drink cans. There will be further chances to win the limited edition product on the Every Can Counts social media channels. Competition details will be announced shortly. Every Can Counts, which is funded by the European drinks can industry, is the lead sponsor for the Trek-Drops professional women’s team for the second consecutive season.